Though it began so promisingly, the Gus Johnson era of calling the play-by-play in Madden NFL is over after two years. The game's analyst, Cris Collinsworth, is likewise out. The reason? Neither of them got in the booth together. For Madden, or for any other purpose. 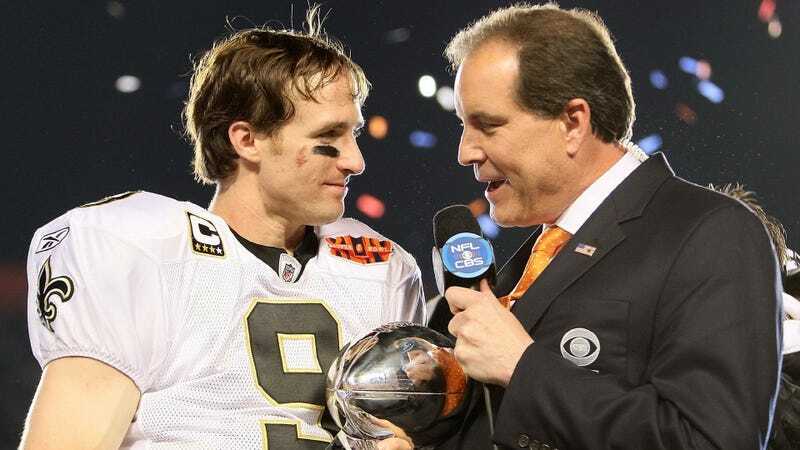 They'll be replaced by a duo who did, because it's what they have done in real life for nine years: Jim Nantz and Phil Simms, the premier broadcast team of CBS Sports. Madden NFL 13 will still retain its own presentation scheme—the game is not mimicking CBS nor any other broadcast package. But if handing the mike to Nantz (pictured above at right), also the voice of EA Sports' Tiger Woods PGA Tour sets Madden on a more blue-ribbon, living-room football foundation in its commentary, it also admits that the game didn't know how to use someone as voluble as Johnson, and couldn't smooth out the obvious distance between him and Collinsworth. Last year's edition of Madden took a puzzling step back in its commentary engine, with Johnson giving the same generic opening for nearly every game played, whether in a season mode or online multiplayer. Cam Weber, the head of American football products for EA Sports, admitted at a media event that Madden NFL 12's broadcast shortcomings—repetition, dead air, and tone-deaf excitement on mundane plays—were largely attributable to implementing a new commentary engine brought over from NHL and FIFA. Thus, we were sold pre-game team runouts, a visual, to cover for the jarring lack of audio that would have introduced a proper broadcast. "It was a painful cycle for commentary," Weber admitted. This year, we've been told to expect something that looks and sounds a lot more like televised football. Not only do the presentation designers on Madden NFL 13 have a better handle on the commentary engine, they benefit from a duo that did work together in recording a lot of their audio. "No dead air," was a mantra the Madden production team repeated, and the banter between Nantz and Simms that EA Sports showed appears to sereve that purpose. They give a variety of introductions, not just for the time of the season, or of the round of the postseason, but in capturing that game's particular story. The same team could be introduced as a divisional rival in one game, the franchise for a hot new quarterback in another, or a contender battling for a playoff spot in a third. Bringing in CBS' A-list broadcast duo concludes a 'painful' cycle for Madden's commentary. Moreover, you will see Nantz and Simms on screen in Madden NFL 13. Not only that, their background will be specific to the broadcast booth location in each NFL stadium. (Candlestick Park's long grandstand and the deep, shadowed angle behind it, was behind them in one shot.) While not motion-captured per se, the two were filmed in a variety of pre-game studio discussions that were then rendered into Madden—so it is not a straight cinematic, either. We saw only a single brief clip but I got the feeling that their on-screen dialog is necessarily generic, before transitioning to off-camera specifics about the two teams on the field. The two will banter mid-game, too—we saw a clip where Nantz teased Simms, the former New York Giants quarterback, about the position, playing to the stereotype of it as a self-centered role. Simms later playfully attacked Nantz's golf swing; he played the sport at the University of Texas. The clips shown were for a reason: to show that the two have a personal rapport that has been absent from the booth team since Al Michaels and John Madden himself supplied the commentary. That's not the only way in which presentation will be upgraded. Madden's developers touted the consultancy of NFL Films in working with the game this year, supplying virtual camera angles—more than 650, they said—that are commonly seen in the iconic highlight reels. These will all meld with 200 new cutscenes, and new interstitial montages more authentic to television. Lighting also has been fine-tuned, and it will reflect seasonal changes. Instead of stark differences in the sun's position and shading as soon as each quarter begins, the atmosphere will change more gradually. A later-season game will darken more quickly than one in September, for example. A new broadcast team is probably the most stark upgrade Madden is revealing at this point. There are gameplay improvements to Madden, including many yet to be revealed. For now, the best description of the gameplay tuning can be found in what I wrote about NCAA Football—because the same core gameplay team serves both franchises. Last year, Weber was said to have doubled the size of that gameplay unit; the personnel increase ended up being nearly three times its original size. The same features I described in my hands-on time with NCAA Football 13 are also to be implemented in Madden NFL 13. These include new passing trajectories and velocities, truer line-of-sight behavior in defensive personnel, and receivers who must be at a point in the route where they expect the ball if they're to catch it. Seriously, it's the same structure, so go back and read my NCAA 13 preview if you haven't.